Toadie Canyon is an east-side tributary to grand Gulch that provides a lesser used access into Grand Gulch. The canyon is quite short, only about 1 3/4 miles in length. The trail down Toadie Canyon into Grand Gulch is a pretty tough hike and this is usually not one of the most popular routes into Grand Gulch. However, it is a great place to hike along the rims of both Toadie Canyon and Grand Gulch. Get to the Toadie Canyon trail head by following the dirt road that runs west from UT 261 at about mile marker 25. The narrow dirt road is generally suitable for most vehicles and ends in a small parking lot/camping area. From here you will easily find the trail that leads down into Toadie Canyon. However, to hike the rims continue to stay on top of the Mesa following the South edge of Toadie. It is often best to rim walk on the Sooth rim of a canyon when possible. When you are hiking the South rim, the rims you see across the canyon are facing the south and these south facing cliff walls are where you can expect to find ruins. Looking across Toadie Canyon we see a row of Anasazi ruins tucked in an inaccessible ledge. The top shot shows the sheer cliff walls that make access to this ruin extremely difficulty. The lower photo is a close up of one section of the ruins. 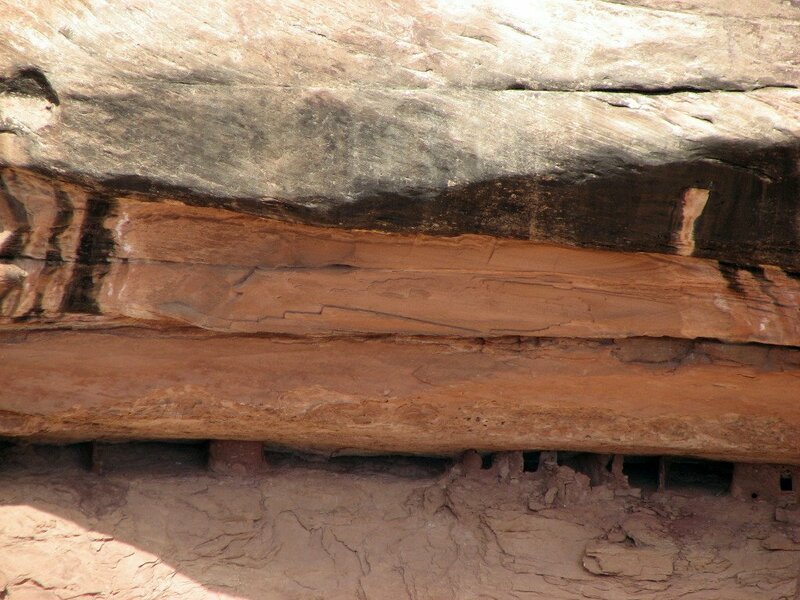 Sure enough, on a long ledge not far below Toadie Canyon's north rim there is a line of small structures. These ruins appeared to be completely isolated, perched on a skinny ledge that appeared to vanish at each end of the row of structures. As they were on the opposite side of the canyon from my hiking party there would have been no quick way to get to them but it was obvious that these ruins would never see our feet as any access to them would be far beyond our climbing abilities. We continued our hike along the rim of the canyon and enjoyed views of the elaborate canyon complex that unfolded below us. The day was cool and windy after a good rain the night before but the rain seemed to have scrubbed the sky clean and it was a brilliant blue sky above us. We soon found ourselves reaching Toadie's Junction with Grand Gulch and we were not surprised to see a very obvious muddy red stream flowing through Grand Gulch. The junction of Toadie Canyon An Grand Gulch is quite a sight with the large Toadie joining the even larger Grand Gulch. It is a spectacular sight that is a great reward for hikers. From here you can continue to rim walk down Grand Gulch or you can retrace your trail back to the parking lot. One thing that I seem to marvel at a lot is how difficult it is to take a photo in canyon country that even begins to do justice to what you actually see. I think that the biggest problems are scope and relief. Things that are absolutely massive in life appear small and insignificant in a photo. I have never developed a photo taking technique that allows me to take shots that adequately show how steep things are. Many of the cliffs and rock faces are absolutely vertical for hundreds of feet. These canyon walls twist and turn creating elaborate mazes that are fantastic to see. As you view the photos that are taken from the rim of Toadie Canyon remember that you could put the Empire State Building in the bottom of the canyon and we would look down onto the top floors.